Halifax Water’s locate requests are now processed by Info-Excavation. How will I request my locate? 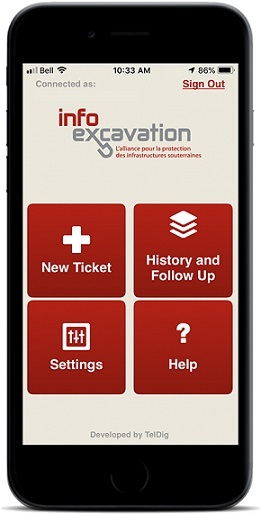 Request your locate electronically at: www.clickbeforeyoudig.com or using the Info-Excavation Mobile App available for iOS and Android devices. When you request a locate electronically, you mark your work area on an online map which is sent to Halifax Water with your request. By using the online method, you can also track your locate requests, search for past locates, and request a renewal in one-click. Who else will be notified? Bell Aliant, Rogers, Heritage Gas, Zayo Group, and Maritimes & Northest Pipeline. Utilities that are not Info-Excavation members must still be contacted directly before beginning your work. Halifax Water locates are free of charge. Emergency locates are still available 24/7 from Halifax Water, however, they are now processed through Info-Excavation. If you have any questions about Info-Excavation or would like additional information, please contact Halifax Water at 902-420-9287. Locate requests can also be made by phone at 1-866-344-5463 (DIG-LINE).